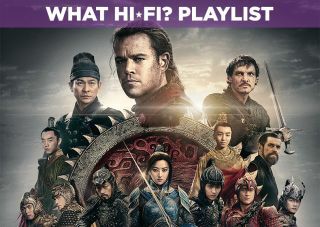 The Great Wall - Blu-ray review | What Hi-Fi? The Great Wall was meant to be the great hope. With Matt Damon in a leading role and Yimou Zhang (Hero) directing, this was a blockbuster that would bridge two cultures, cement China as a coming force and open more doors for Hollywood in what is the fastest-growing film market. It didn't work out quite as planned. And it’s not because The Great Wall is a bad film. It’s one that, despite the quality of talent in front of and behind the camera, is distinctly average. The plot is simple and appropriately daft. Matt Damon and Pedro Pascal play William and Tovar, European mercenaries looking to find the source of gunpowder (or black powder, as the film calls it) in China. They narrowly escape local bandits but (somehow) stumble across the Great Wall of China. They're imprisoned by the Nameless Order, an army trained to defend the wall from a horde of monsters called the Taotie (pronounced tow-tee) that attack every sixty years. With the Taotie getting smarter, will William and Tovar join the fight and stop the wall from being breached? It's a decent set-up for an action adventure (why was the Great Wall built?) and it's ripe for a culture clash of identities and philosophies, but the film is surface deep. Supporting characters lack depth, with some having so little impact on the story we’re not sure why they're in the film. There's a generic feel about it, and apart from the setting there's little to really distnguish it from other fantasy films. The Taotie are derived from Chinese mythology but, apart from a few distinctive traits, they're another unmemorable CG horde. A few aspects help to prop the film up. Damon and Pascal make for an enjoyably odd couple, bickering throughout as they plot to escape the wall with the gunpowder they’re searching for. Zhang brings variety to the action scenes but, while they're neither repetitive nor boring, it’s a workmanlike effort – not quite the style you’d expect from the director of Hero or House of the Flying Daggers. The scale and grandeur of the production is impressive at times, though. Acting-wise, Damon’s William is stoic but stiff in scenes where he’s not playing off Pedro Pascal. His accent is a baffling one. Irish? English? Scandinavian? We have no idea. Tian Jing (above) plays Lin Mae, a soldier in the Nameless Order who develops a relationship with Damon. But like many other characters, she isn't helped by a lack of character depth and development. Andy Lau’s Strategist Wang is given the thankless task of Mr Exposition (and every now and then Mr Translator), while Willem Dafoe's Ballard feels less a character and more a plot point. At least Pedro Pascal – who doesn't like Pedro Pascal? – finds the right tone to pitch his character and comes across as the most enjoyable of the lot. In terms of A/V The Great Wall is a brighter prospects. Shot digitally, it's a colourful film - though it errs towards a more a muted palette until we reach the capital Bianling, where the colour really pops off the screen. These scenes feel awash with colour, and are a good test of a TV's colour and contrast levels. Detail is very good. Have a look at the sweaty and dirty faces in the close-ups at the film’s beginning to get a sense of it. A TV that's dialled in should be able to pick up the details of Nameless Order’s burnished armour, which reveals some nicely etched patterns. Shadows are well defined as well, with some pretty good blacks on show. Skin-tones look natural, especially given the range of complexions among the Chinese cast. The Dolby Atmos soundtrack is even better, with good use of the surround channels to simulate movement of the Taotie and some nice panning effects - any time there’s a flurry of arrow strikes there’s a rush of noise. Whenever the war drums kick off you can feel the rumble but it never drowns out other elements. To our ears it’s a dynamic and layered soundtrack, adept at conveying quiet, still scenes very well but also able to ratchet up the size of the sound without losing clarity. The fog scene towards the middle of the film is a good showcase for this. Dialogue is prioritised in the centre and is distinct (even Damon's accent), with Ramin Djawadi's score (for most part) presented in the front surrounds where it doesn't get lost in the big action scenes. The main theme is rather catchy too. In terms of visual and audio performance, at least, The Great Wall does not disappoint. The Great Wall is a misfire. It's a big, lavish production, entertaining in places but often too formulaic and familiar to make an impact. Apart from some impressively staged action scenes, there isn't much that will grip you. The Great Wall lacks that inspired touch - and could probably use more humour. It's not a bad way to spend two hours, but the predictable manner in which the story plays out leaves you wishing for more invention. If you are a fan, the A/V performance is something you'll want to hear and see with the best set-up possible. Otherwise, this is an ok watch if you like fantasy aventure films and have a couple of hours to spare.